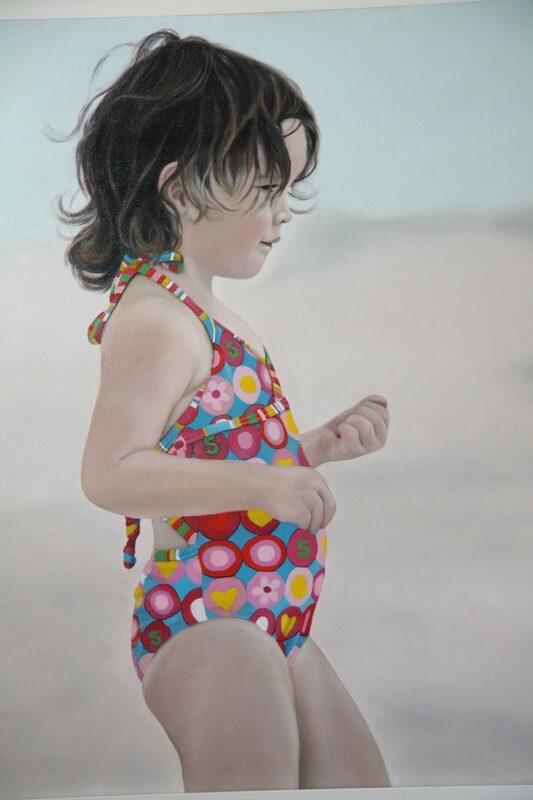 Young children are beautiful to paint. It’s something about their lovely skin, plump arms, bright eyes and smiles. They are also the hardest to photograph for their painting. Some kids, like my two cherubs, have lived their life in front of a camera and will “strike a pose” on cue often to the detriment of getting a natural shot. If they know Mum has a camera in her hand, out come the cheesy grins, Bratz doll poses and generally any look that is totally unsuitable to paint. Some kids are completely camera-shy. A look of horror mingled with a forced polite smile is also not that brilliant to paint! This is where “Stealth Photography” becomes your best friend….completely ignore the child, allow them time to find something more interesting than you and your scary camera, use a zoom lens so you can sit or stand a little distance away (which gives wonderful depth of field for portrait photos) and start clicking away. The photo for “Darcy” was taken on a rather overcast day on a local beach, with not too many people around to get in the background shot. Darcy was being very contrary that day ( I can say this as she is my niece!) so I quietly watched her until I got this awesome shot. Brand new bathers highlighted beautifully against the sand. Previous Hello World! Welcome to Mia’s Art.